Crock Pot Baked Potatoes not only work and taste great, they are the closest to a steak house baked potato I have ever made! Delicious. Normally, I bake potatoes in the oven and it takes about an hour. That is not too long, but in the summer, the oven does put out a lot of heat. The bottom line is that during hot weather, I don’t want to heat up the kitchen if I don’t have too! Maybe you can tell by the recipes I have shared lately, I have really been using my crock pot. More specifically, I use my roaster. With 5 growing boys and their farm boy appetites, my 6-quart crock pot (affiliate link) is just not large enough anymore, but my 22 qt roaster is! So, having just bought a case of potatoes, I wanted baked potatoes and I had what I thought was a brilliant idea – I would try them in the crockpot. Turns out, this was not as ingenious as I thought – I found several articles about crockpot baked potatoes after I did it. 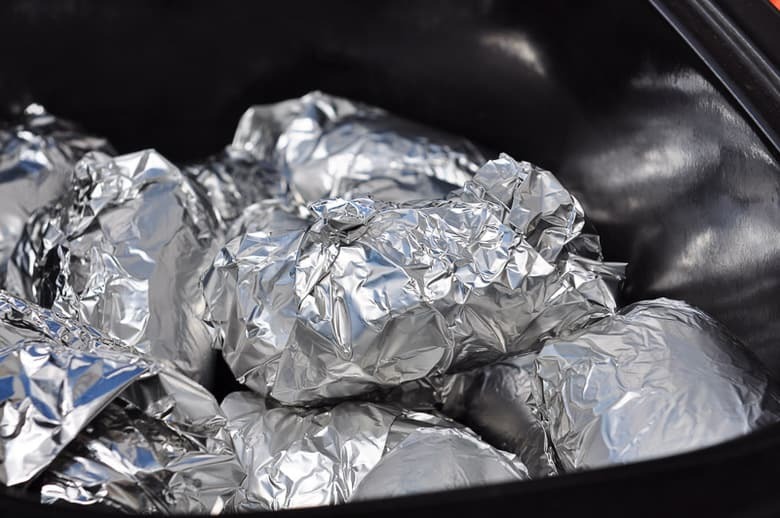 Some of the recipes crinkled up aluminum foil in the bottom to rest the potatoes on and others oiled and salted the potatoes before wrapping them individually in aluminum foil. Crock Pot Baked Potatoes Are So Delicious! Why then, if other recipes are out there, would I post about it? 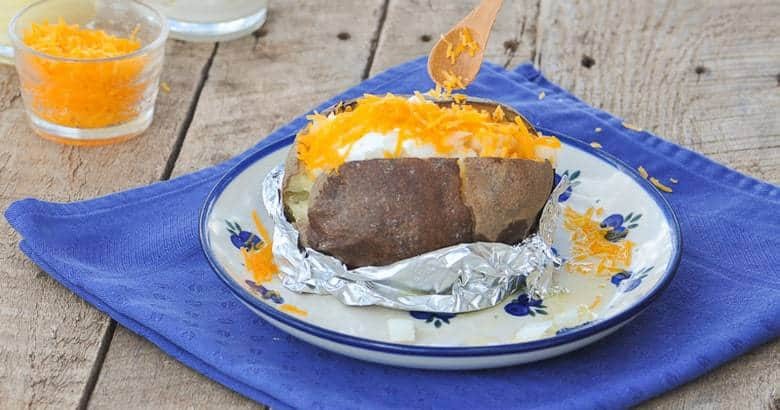 Because, I want you to know that not only do baked potatoes cooked in the crock pot work, they are super easy and taste great – without crinkled foil or other seasonings! Don’t get me wrong: I love seasonings on my baked potato. But I felt like we could do better. Potatoes are delicious on their own and there’s no need to complete lots of complicated steps to get them to taste delicious. So although I will absolutely eat a potato with salt and pepper (and maybe a little onion powder), I thought it best to start from the most natural taste and work our way to the spiced recipes from there. In fact, this is probably the closest thing to a steak house baked potato that I have ever made! Besides, there is just something about preparing the ingredients, turning on the crockpot and coming back in a few hours and having your meal ready – it’s magic! Once the crock pot has worked its magic, don’t forget the toppings – loaded baked potatoes are a meal in themselves! 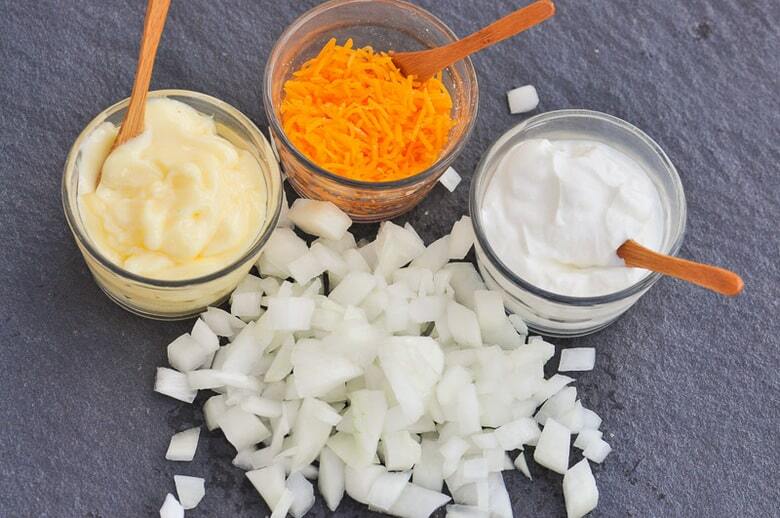 Our standards are creamy butter, sour cream and onions. In the winter we like sauteed onions with barbecue sauce. Other veggies like broccoli are also good toppings for a baked potato especially if it is swimming in cheese sauce! Mushrooms and bacon are another option – let’s just say that the options are endless when it comes to making a loaded baked potato! If you want an even easier meal setup, why not try a baked potato bar? I love this option for making up a meal for my family. Again, this all goes back to striving for a natural taste first and then building upon it. I’m sure potatoes baked with spice inside from the get-go taste delicious! But they’re not what I’m looking for. I want a potato that I and anyone else in my family can put anything they want inside. But still savory and full-bodied! The preparation for crock pot baked potatoes is very similar to oven baked potatoes. And, you could do it all the night before so, in the morning, all you have to do is plug in the crock pot. First, wash the potatoes. I did not even poke holes with a fork or rub them with olive oil! I just wrapped each potato in aluminum foil, placed them in the crockpot (roaster) with about an inch of water in the bottom, and cooked them on low for 8 hours. That’s all! You can’t get much easier that that! rich in fiber (when eaten with the skin), contain very little fat and no cholesterol. The fiber content aids in the slow digestion of the starch and absorption of simple sugars in the gut. This helps keeps blood sugar levels within the normal range and avoid wide fluctuations. rich in potassium – potaotes contain more than a banana! Potassium is a mineral that helps regulate fluid and mineral balance within cells, this means it helps regulate blood pressure. a good source of vitamin C which is an antioxidant, helps with iron absorption and among other things supports your body’s immune system. a good source of vitamin B6 which aids in carbohydrate and protein metabolism, helps the body make amino acids and is part of the red blood cells. a good source of other minerals, such as, manganese, magnesium, phosphorous, copper and potassium. suggested by plant genetics scientist Roy Navarre in a recent study at Agricultural Research Service to help fight cancer and to be heart protective because of a flavonoid antioxidant, quercetin, contained in potatoes. Notice how I wrote “with the skins” in bold type. This is partly out of frustration because I frankly cannot understand why so few dishes feature potatoes with the skins on. Do they not know how much nutrition they’re leaving behind when they do that?? It boggles my mind. Like any other food, potatoes have a certain design for a reason. The skins of a potato guard all the goodness inside, yes. But it’s not completely useless like, say, the skin of a kiwi fruit. There’s no conventional seed structure in a potato. All bets are off, so feel free to eat the skin! 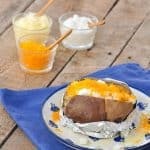 If you’ve tried these crock pot baked potatoes or any other recipe on Cultured Palate please take a minute to rate the recipe and leave a comment letting me know how you liked it. I love hearing from you! You can also FOLLOW ME on PINTEREST, FACEBOOK, INSTAGRAM, YouTube and TWITTER. I love "baking" potatoes in the slow cooker because it's totally hands off and assures they are fully cooked. Wash the potatoes and cut out any bad spots. Rub the potatoes with olive oil if desired. Cook on low for 6 - 8 hours - fork should insert easily. About 4 lbs of potatoes will fit into a 6 qt crock pot. I cook 10 lbs of potatoes in the roaster and could probably do 20 lbs. Note: Nutrition information includes olive oil. What a super great idea for the summer. I can’t wait to try it. Linda, thanks for stopping by and it really is an easy way to bake potatoes! What a great idea. I have four boys. They can eat. Anna, I know just what you are talking about with boys and how they can eat! This looks amazing and super easy. I tried this method with sweet potatoes and they turned out great, too. Thanks for a great hack! Thanks, Marie, I’m glad to know it worked so well! Thanks for sharing such a brilliant recipe! I loved featuring it in my Slow Cooker Sides roundup (http://holleygrainger.com/slow-cooker-side-dish-recipes/). This is something I need to make at the beginning of the week so I will have them on-hand for a quick lunch or dinner side. Cheers! 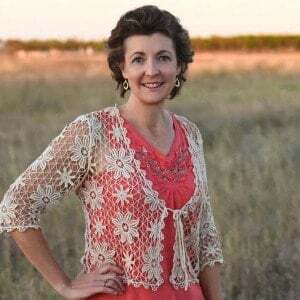 Thanks, Holley – I appreciate your including it! 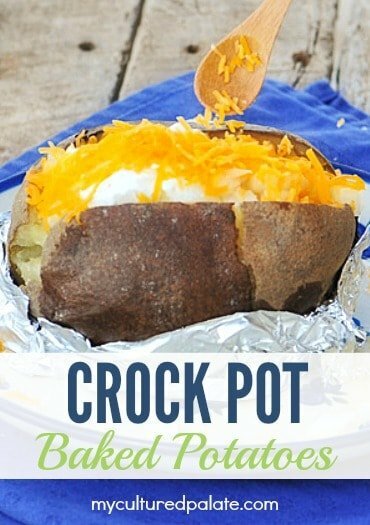 I’ve never thought of making baked potatoes in a crock pot before, great idea!